This month on The Writer and the Critic your hosts, Kirstyn McDermott and Ian Mond, present Part the First of their special eBook Extravaganza! Yes, that's right ... unable to condense the discussion of six books into less than three hours, they have wisely decided to split the podcast into two episodes. You're welcome, listeners. 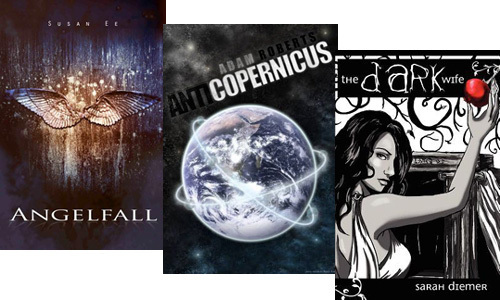 After some brief introductory remarks, Kirstyn and Ian jump straight into the dissection of the first three books up on the block: Angelfall by Susan Ee (at the 3:20 mark), Anticopernicus by Adam Roberts (32.15) and The Dark Wife by Sarah Diemer (1:01:20). Along the way, Kirstyn recommends this series of philosophical reviews of Anticopernicus by Rich Puchalsky for further reading, while Ian notes a discussion of difficulty in fiction by Adam Roberts, which was in turn inspired by a 2009 essay by John Lanchester. Sarah Diemer's thoughtful explanation of why she chose to self-publish her books can be found here. For those who've been skipping ahead to avoid spoilers, you can tune back in around 1:30:20 for a very quick wrap-up. They'd love to hear your feedback on all the eBooks they've discussed!